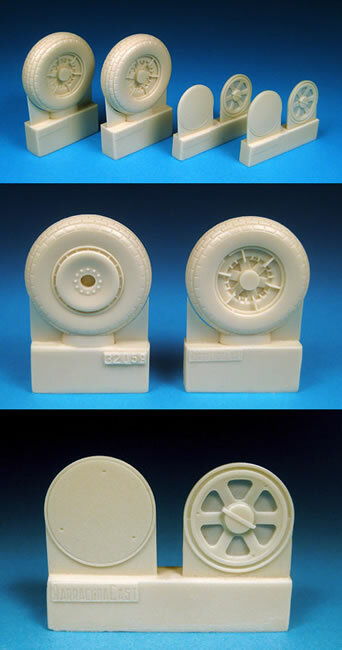 Barracuda Studios is proud to announce the release of 3 new 1/32nd scale products in the BarracudaCast resin detail set line. These sets are up on the website now and available for order. Shipping will begin on February 4th. These new sets are designed to upgrade the very nice 1/32nd Hasegawa and Trumpeter kits, and will certainly upgrade the much older but still viable Revell kit. The Trumpeter wheels are badly in need of replacing, as the hub detail is just plain wrong . 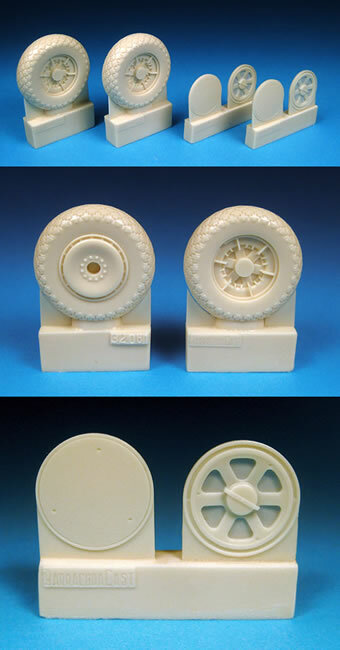 These new wheels have been designed with a level of detail not available before for the P-47 in any scale. Three common tire patterns are available, and for the more adventurous, they can be mixed and matched, as is commonly seen on many aircraft. While the Diamond tread pattern is more common, the crews fitted whatever tires they had to hand. Even with well documented aircraft, you do not have to use a certain style of tire, as the day after the photos were taken, they could easily have changed one or both of the tires, so go with whatever thrills you! 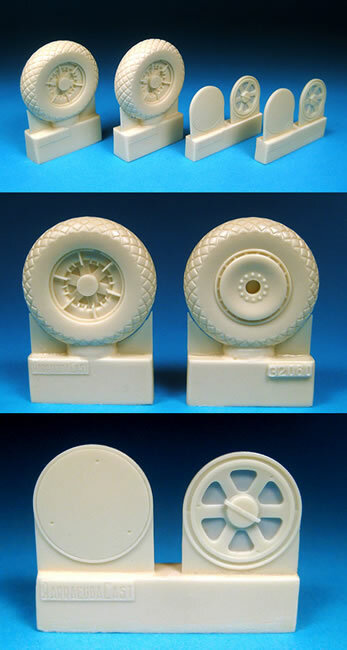 This set contains a pair of detailed resin mainwheels with crisply molded, seamless and accurate block tread pattern on the tires. You can choose between the included plain covered or 6 slot hubs. The inner wheel hub detail is visible through the slots of the outer wheel hub, bringing a whole new level of detail. Makes a quick, easy and very visible upgrade to the Hasegawa, Trumpeter (whose wheels are just plain wrong) and Revell Thunderbolt kits. This set contains a pair of detailed resin mainwheels with crisply molded, seamless and accurate diamond tread pattern on the tires. You can choose between the included plain covered or 6 slot hubs. The inner wheel hub detail is visible through the slots of the outer wheel hub, bringing a whole new level of detail. Makes a quick, easy and very visible upgrade to the Hasegawa, Trumpeter (whose wheels are just plain wrong) and Revell Thunderbolt kits. This set contains a pair of detailed resin mainwheels with crisply molded, seamless and accurate cross tread pattern on the tires. You can choose between the included plain covered or 6 slot hubs. The inner wheel hub detail is visible through the slots of the outer wheel hub, bringing a whole new level of detail. Makes a quick, easy and very visible upgrade to the Hasegawa, Trumpeter (whose wheels are just plain wrong) and Revell Thunderbolt kits. We're pretty sure you're gonna like these new mainwheels. There are more 1/32nd P-47 products in the pipeline. More news soon! Also coming soon are the much requested reprints of the 1/32nd P-51D Mustang Part 1 (BC32009) and 1/72nd P-51D Mustang Part 1 (B72009) decal sheets, as well a s a reprint of the 1/32nd P-51D Mustang Cockpit Stencils and Placards (BC32010) which is now temporarily out of stock. These sheets are at the printers now. We will make an announcement when they are back in stock. Lots more new stuff coming soon.